From Friday night to Monday afternoon, Whit Camp is always a full-on, action-packed weekend and this year was no exception. From Friday night to Monday afternoon, Whit Camp is always a full-on, action-packed weekend and this year was no exception. In addition there is always a solid theme to the meetings and tent chats, with thoughts to ponder in those brief moments of down-time. This Camp the theme was Big Questions. With two tents of Juniors, many of whom were coming on a USG Camp for the first time, each day started bright and early, so when Evie and I (part-timers, but she is only 8 months old) turned up at the Camp field on Saturday morning to help with breakfast, I was met with tales of night time mischief, talcum powder and shaving foam. Handily for them, the first activity after breakfast was to be the Hydro Olympics, a good way to clean up. Judging by the amount of washing-up liquid that was being borrowed from the cook tent, the giant water slide seemed to be a great success, the drain-pipes with holes in, less so. 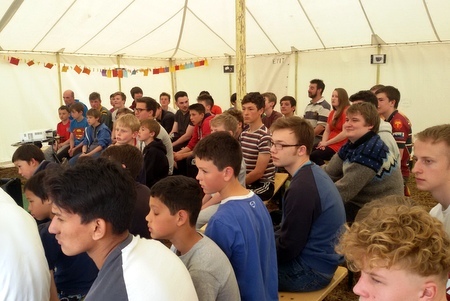 The main meeting of the day really got stuck into the spiritual theme for the Camp, with the Big Question on Saturday being: Where are you with me? 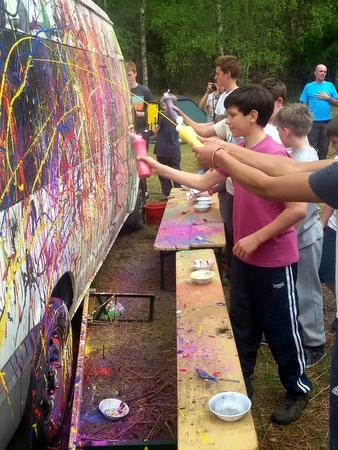 Tommy C presented an impressive rundown of the Ten Commandments, and the talk culminated in a response time involving a minibus, lots of paint, and a pressure-washer. Sadly Evie and I left before the Wide Game, but from the impressive array of scratches and bruises the next day, it looks like much fun was had. Swimming was uneventful, and a day with take away chips for tea can’t be bad. Sunday, after a Brekka Chat from Steve about the danger of being in the wrong place at the wrong time What are you doing right now?, started with Camp Building out in the woods- run primarily by Senior lads. Nothing as adventurous as last year’s tepee, but some impressive structures all the same, including one with a ‘built in shower’. Colin then broke out the ice-pops and newspapers for a Chill Session, before Ironball got everyone up and dashing around again. 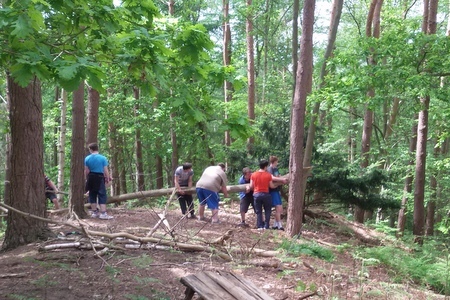 Lunch, football competition and pack-up… Whit Camp was over for another year.